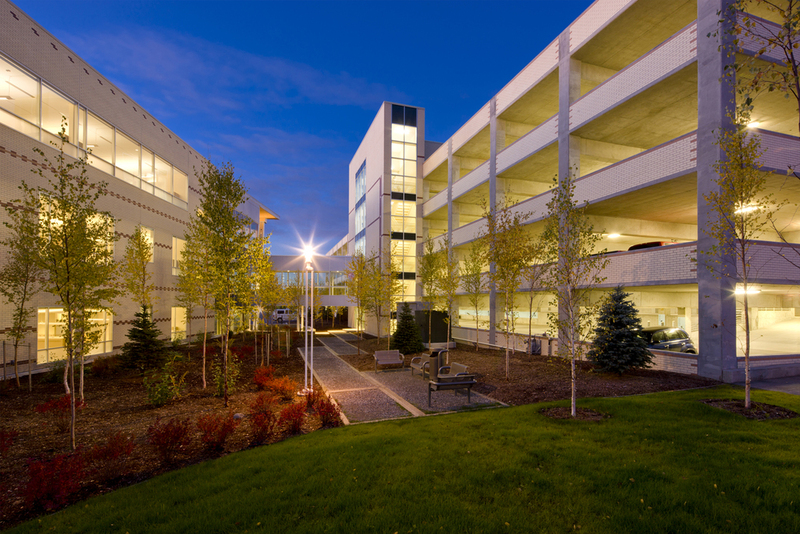 This five-tier parking structure, accommodating approximately 480 parking spaces, was designed to replace and supplement surface parking at the Southcentral Foundation Tudor Centre Medical Campus. The addition of covered parking and a second-level skybridge, linking the garage to the Primary Care Center, improves patient access to the medical clinic during the long winter months. To provide a more efficient layout and to minimize required ramping, the structure was designed with offset parking tiers. Two entry and exit points facilitate continuous traffic flow during peak periods of the day, creating a better passthrough and parking experience for visitors. The design incorporates a brick-tile façade integrating the parking structure aesthetically into the campus and complementing the new clinic addition, also designed by KPB Architects with NBBJ.